More than 10,000 likes now for Making Europe a Wilder Place! 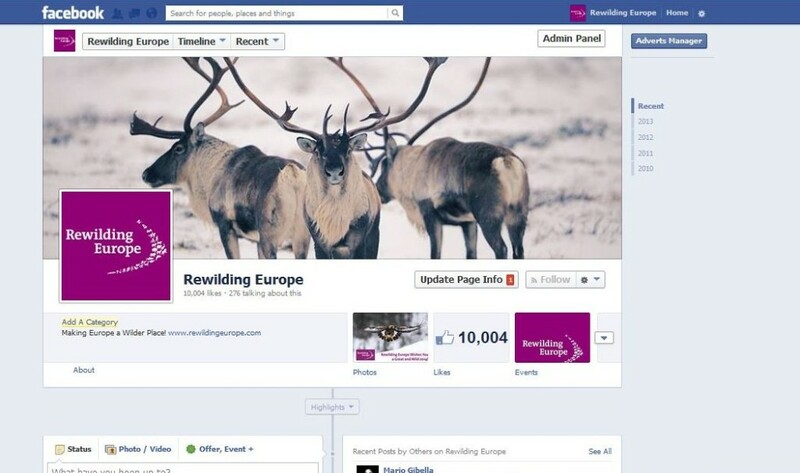 Rewilding Europe’s facebook page reached 10,000 likes! We are very happy to see the rapidly growing interest in what we are trying to do, in the rewilding concept and its expansion, and in the many rewilding areas. Many thanks to you all for your thousands of facebook likes, to all these committed and passionate supporters of the idea to Make Europe a Wilder place! The likes of our facebook page origin from many countries all across Europe and also from other continents. Thanks all for liking and sharing our posts. The news about the launch of the report about the ”Wildlife Comeback in Europe” was one of the most liked and shared posts. Also the generous offers from our rapidly expanding Travel Club has sourced many likes as well as new Travel Club members, and no wonder – where else can you win fantastic nature holidays and visits at no local cost at all? Several of our local rewilding teams have now started up their rewilding Facebook pages, and interest there is also also constantly growing: Rewilding Romania (news about and from Danube Delta and Southern Carpathians), Rewilding Velebit, and Western Iberia. Please check them out and have a look there, too! Thanks all for sharing, commenting, liking and spreading our posts! More than 15,000 likes now for Rewilding Europe!